Indian rescue workers search for survivors in the wreckage of a train that derailed near Pukhrayan in Kanpur district on November 20, 2016. 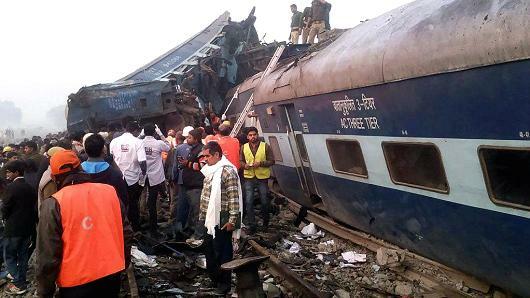 INDIA, 20 November – An Indian express train derailed in Uttar Pradesh on Sunday. Victims are 142 and injured people are at least 200.The train derailed in the early hours of Sunday, when, according to survivors, passengers allegedly were sleeping. At the moment, the element to clearify is the cause of the accident. Authorities are looking into the possibility a fractured track caused the train to roll off the rails on its journey between the Indian city of Indore and the eastern city of Patna. It happened in Pukhrayan, 65 km south of Kanpur city.Several people among those involved in the accident were taken in critical conditions to government hospitals. Ths has been the deadliest rail tragedy in India after 2010 collision in West Bengal, which caused 140 died.India’s railways minister, Suresh Prabhu said in a tweet that the government is investigating the causes of the derailment and promised accountability with the “strictest possible action”, as well as compensation for the affected passengers. MEDICAL FAIR THAILAND 2017 – Discover the date!